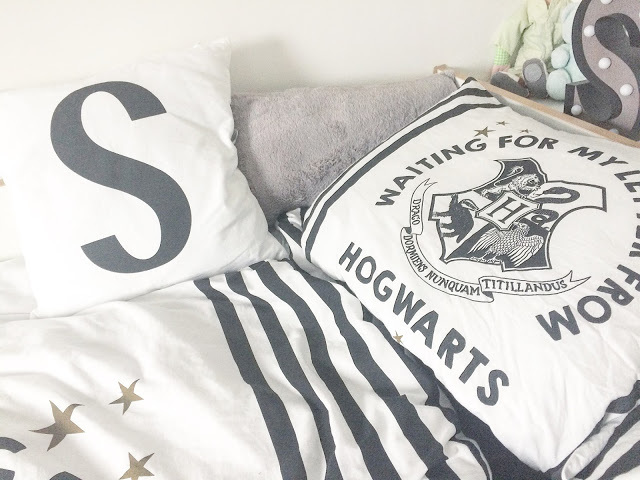 Harry Potter and monochrome? My two loves in life. Two weeks ago, I made my big move to Sheffield. In fairness, I went away to the Peak District for five days so it’s only been just over a week but it’s finally a place I can call my own. Yes, I might only be renting but if you’re ever stayed in student accommodation, you’ll know how, well, generic, it can be. I’m lucky that I could afford a decent studio flat because I could not see me coping having to share a kitchen and/or bathroom again! 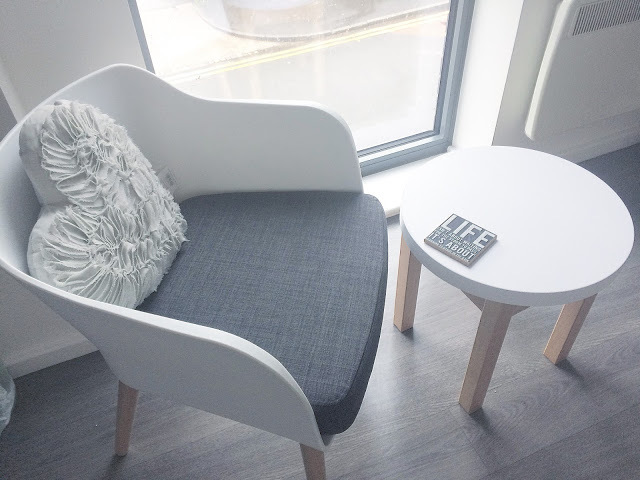 I’m living in a brand-new build where as well as my flat, there is a small gym, laundry room and communal areas. It’s pretty small for student accommodation but I like the fact that there aren’t hundreds and hundreds of students running around and being a nuisance! Onto the room itself, like I said, I am staying in a studio flat. I have my own living area, kitchen and bathroom. 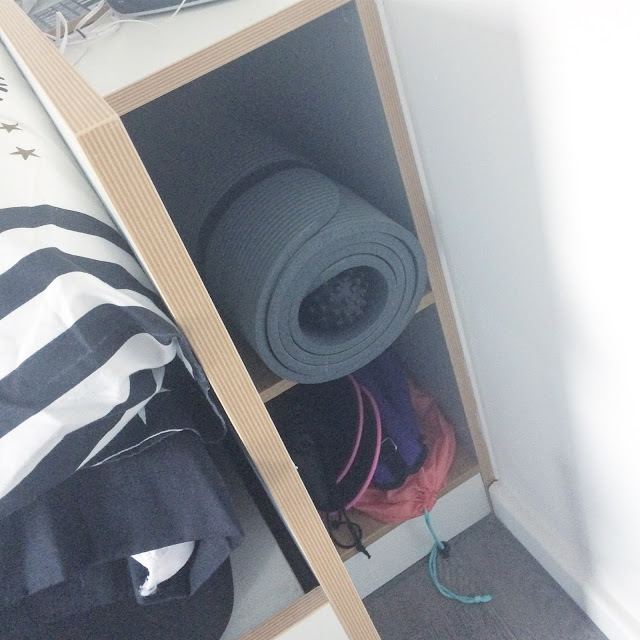 There’s quite a bit of storage space but a girl can never have too much storage, right? I’ve really tried to make it look as homely as possible so I really hope you guys like it. I won’t bother explaining where I got every single item but most pieces are from Primark, Asda, Wilko and the bargain shops: all those poundshops, Home Bargains and B&M. I love going through cheaper shops because they have really been killing it in the homeware sections lately! If you want to know where a specific item is from, just leave a comment or ask me on Twitter! Being cosy in bed is my number one priority. I brought most of my bedding sets from home as I have tonnes of it! 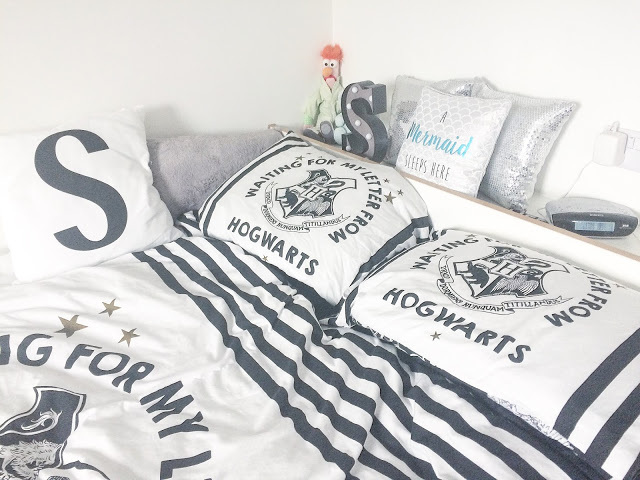 I had to bring my HP duvet set with me of course. I also thought that you can never had too many cushions so I may have stockpiled before and after moving. Having these cool shelves down the side of my bed are the perfect places to keep my home gym equipment! I made sure to bring my basic home-gym stuff: yoga mat, resistance bands, mini bands, ankle weights, sliders and a small ball foam roller. Since then, I have purchased a pair of light dumbbells too. I mean I’ve only used these things a couple of times since moving but I definitely want to make more use out of them! Yes I bought a shoe rack because I’m more of a shoes than a bags girl. Having a planner on my desk really helps me visualise my plans! As soon as I received my new Personal Planner calendar, I knew I was taking it with me. 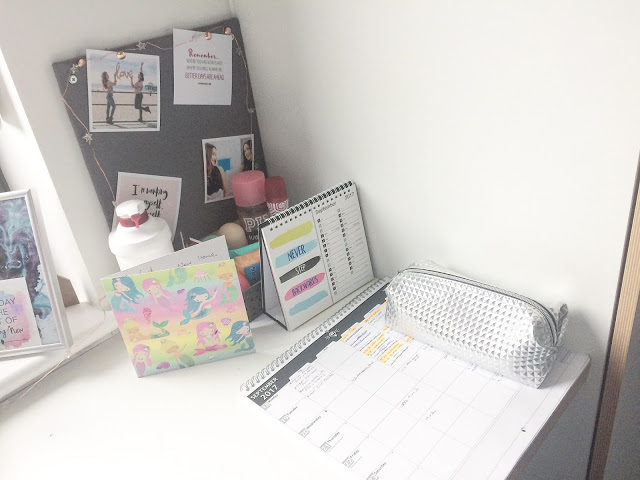 I was able to customise the column headers so I have a section for my blog, work, uni, workouts and TV (it’s very important!) and having this out all of the time helps me to see what I have coming up over the next week! There’s plenty of room for writing and jotting and I like to highlight a task when I’m done with it! 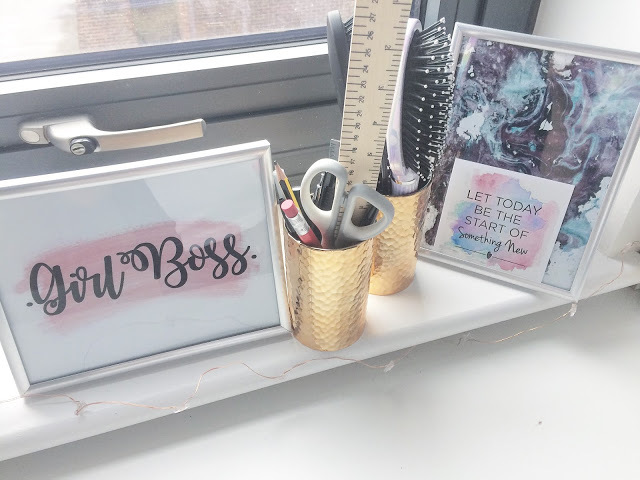 I first discovered Personal Planner on Twitter and Instagram and fell in love with their range from the off. I love the personal element of them more than anything; you can make them up however you want to and to whichever style suits you! 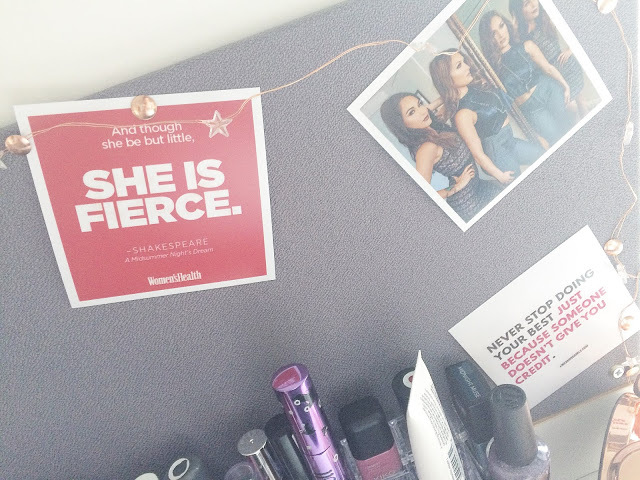 Fairy lights and motivational quotes keep me going! I also recently got these super cute prints from Printiki before moving too. I’m not really a photo-taking person so I went for more motivational quotes and strong women instead. 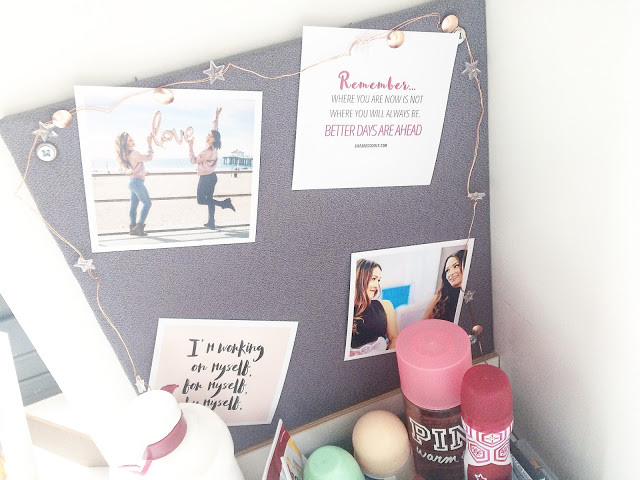 I had to get the Bella Twins, the TIU ladies and Misty Copeland on my pinboard somehow and these gorgeous Primark string lights really add to it. I can’t stick anything on the walls so I was glad to have a small pinboard instead! I had a nosy on Printiki’s Instagram before moving and got some serious room envy and it was great to take some ideas from their feed and find fresh ways of showing your photos. Prints and metals really go well together. My dad bought this cute knitted sheep as a good luck gift. 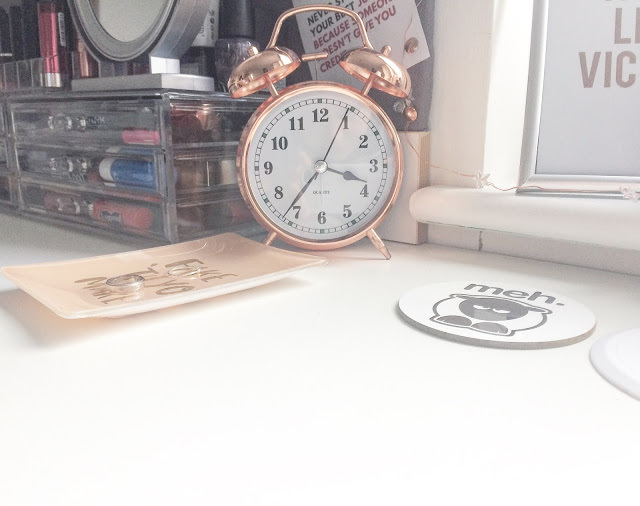 I bloody love this copper clock; Wilko have some amazing stuff in right now! 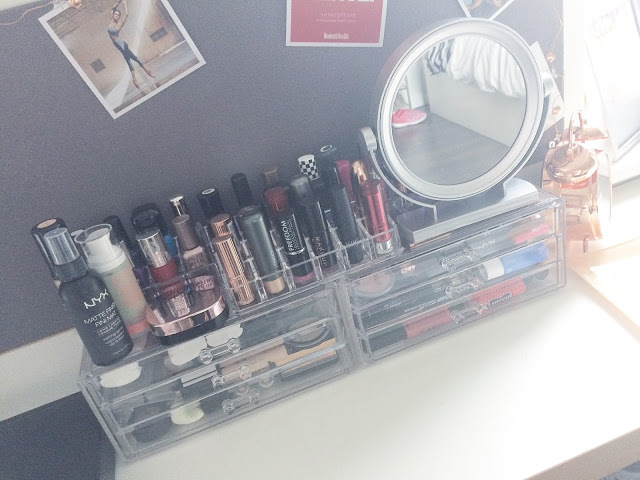 Make up storage was essential and I managed to find some bargains! 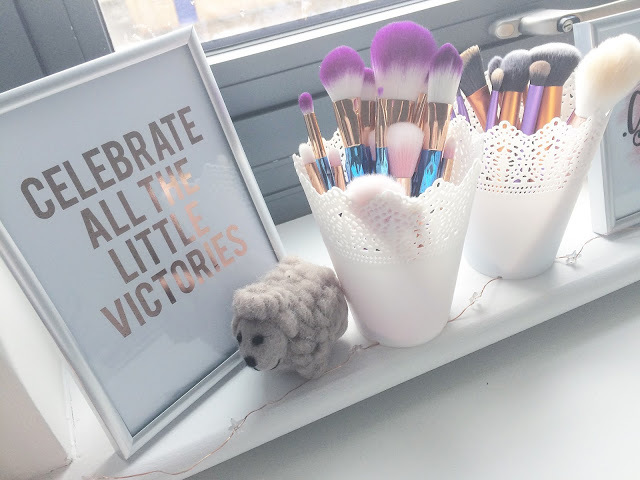 I debated whether to bring my make-up drawers from home as I spent quite a bit of money on them; however, I didn’t know if they’d fit! I ended up paying about £15 for the two drawers and three lipstick/nail polish stands on top. They’re actually the perfect size for all of my stuff! I had to have some Bella Twins in my room somewhere! 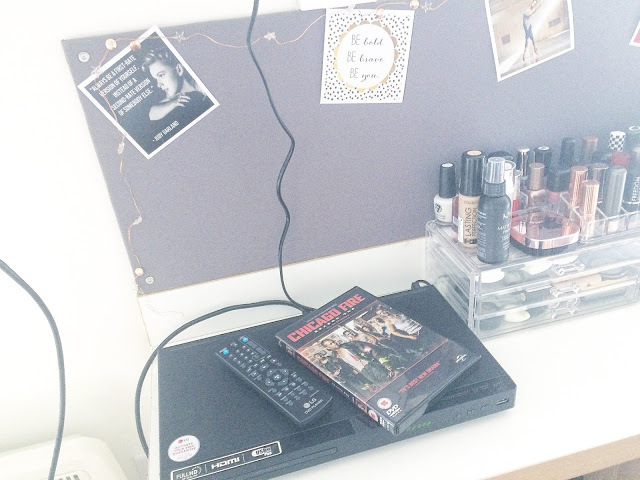 I’m glad I brought my DVD player with me so I can binge-watch box sets. 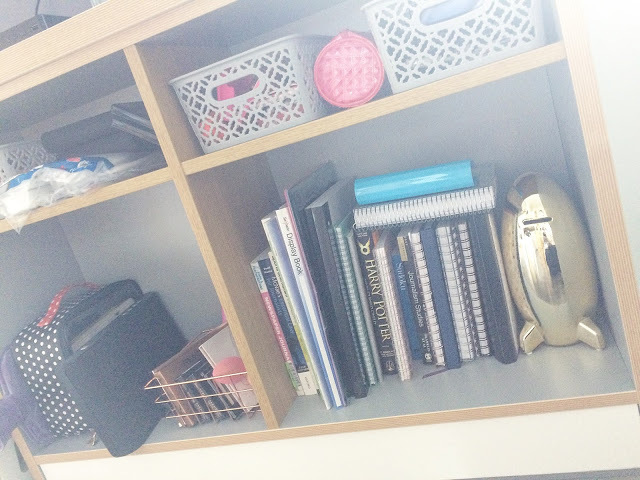 My cute, under-desk shelving is perfect for book, diaries and my rocket money box! I think these shelves are my favourite part of my room. I love that there’s two deep and two shallow shelves here. I keep stationery and smaller items on top and books/bulkier items on the bottom. I’ve got too many diaries with me and I think I need to take some back home with me so I have more room for textbooks! 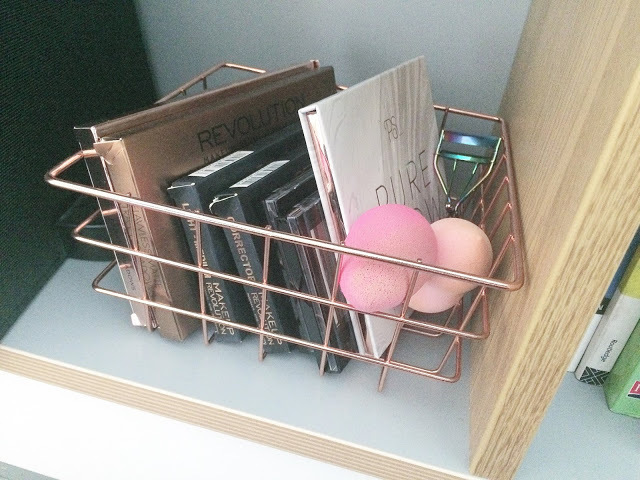 I had to find a copper basket for all of my palettes! I love that I got a cute chair and coffee table so I can people-watch out of the window. I thought I wouldn’t bother with a kitchen/bathroom tour because both are fairly small but just the right size for me. I’m really proud of my new little place; it doesn’t feel too much like student accommodation but that’s probably why I liked it in the first place! Thank you to Printiki and Personal Planner for gifting me items. All reviews are my own.